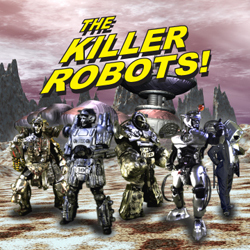 We have a new teaser trailer for the Killer Robots movie (tentatively titled “The Killer Robots! Crash and Burn”) . You can check it out at http://youtu.be/WfdfHmgk1-c. There are still quite a few shots left to composite, but we should have a rough cut of the movie by November. Also, Check out some new photos in the KR Next Movie still gallery – featuring a few as-of-yet unseen characters and events. Saturday, August 9th – Orlando Nerdfest – Airport Marriott – 12 Noon Lunchtime apocalypse!